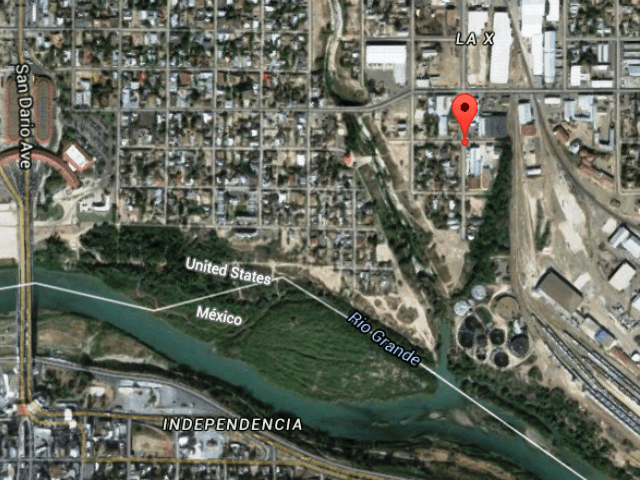 This is a follow-up story about the murder of Brian Terry. In December of 2010, US Border Patrol Agent Brian Terry was murdered by a gang of Mexican banditos. 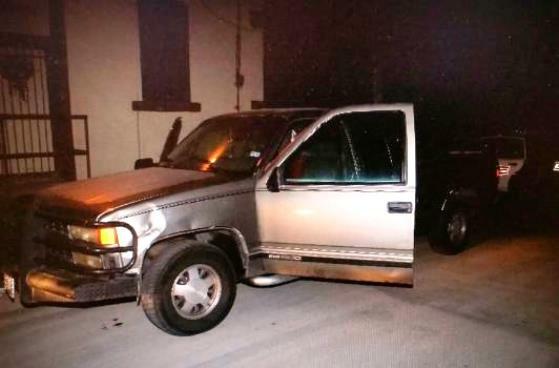 Two of the weapons involved in the shooting were learned to have come from a federal program called “Operation Fast & Furious”. Recently the House Judiciary Committee under the leadership of Chairman Lamar Smith (R-TX) held a hearing to receive testimony from US Attorney General (AG) Eric Holder as to the Justice Department’s involvement in this operation. Congressman Ted Poe (R-TX) is a member of that committee and recently sat down with me to discuss this and other matters related to Border Security and Illegal Immigration. Congressman Ted Poe discusses Operation Fast & Furious with Bob Price. Poe stated that 200 Mexicans have died and at least 2 American law enforcement have died because of this operation. The third thing Poe said was, “I asked him, who was in charge of this operation?” Holder’s answer – “I don’t know!” Poe said that answer was preposterous. Poe went on to say, “If he (Holder) didn’t know who was in charge, is there a rogue operation going on in the Justice Department?” If there is some “rogue operation” going on, why has the Justice Department been unable to figure that out? Poe said Holder should resign and President Obama should appoint a special prosecutor to completely investigate this operation. I asked Poe about other’s calling for impeachment of the AG. He said that impeachment would take too long, citing next year’s elections. He went on to say the Senate would never convict anyway. If Obama does not appoint a special prosecutor, Poe felt certain a new president would in 2013. I asked Poe what he learned that he did not know before the hearing. He expressed that he was surprised to learn that Mexico did know part of the operation but not the entire operation. Poe asked Holder during the hearing, “Would you agree this was reckless conduct on the part of the part of the Justice Department?” Holder replied, “Yes, I would agree that it was reckless.” Poe pointed out that under Texas law; reckless conduct that resulted in the death of another peron is manslaughter at which point Holder backed away from his comment. We went on to discuss the family of Agent Terry and their desire to see justice done. We talked about how the over aggressive prosecution of Border Patrol agents, like Agent Jesus Diaz, might have led to hesitation in response by Border Patrol Agents leading to their deaths. And finally, we wrapped up the interview following up on our previous discussion about Congressman Poe’s bill on border security that would place 10,000 National Guard troops along the border, under the direction of border state governors but paid for by the federal government. He told me this bill is still in committee and they plan on moving it forward next year. At one point in the interview, Poe mentioned Holder’s reputation for not reading legislation citing the AG’s failure to read the Arizona 1070 bill prior to filing suit against the state of Arizona and even before testifying before Congress on the matter. Here is a video of that exchange between Poe and the AG. We left this interview knowing we have much more to discuss. As the Congressional investigation continues, I will check back in with the Congressman to bring you updates on the progress of the investigation. If you have questions you would like me to ask the Congressman on this matter, please reply in the comments below and I will bring them up in our next interview. Impeachment not Firings - Justice must be done! Recently Sen. Grassley appeared “On the Record” with Fox News’ Greta Van Susteren. During the interview, Van Susteren refers to a letter from the Assistant Attorney General, Ronald Welch where he committed several lies to Sen. Grassley. I had previously included that letter in one of my articles earlier this year, and the letter is attached below (2 pages). Clearly this operation was ordered from the highest levels of our government. The Obama Administration came to office with an agenda to create tougher gun control laws. 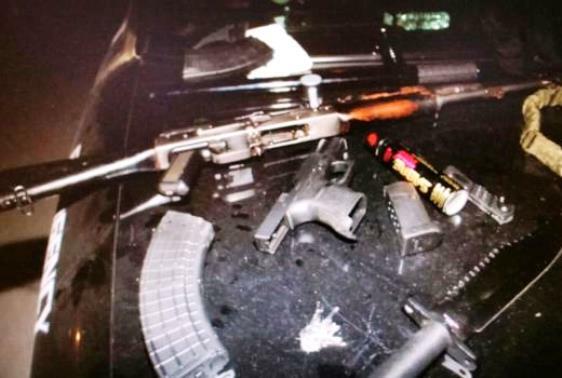 Operation Fast & Furious was conceived to create the impression that lax gun laws were leading to supplying Mexican drug cartels with weapons. This, in their sick belief system, would then give the administration the “moral authority” to create restrictions on Americans’ Constitutional Right to own weapons. Congress Prosecutes Baseball Player for Lying – Justice Department does it all the time! Federal Judge Reggie Walton declared a mistrial today in the trial of baseball legend Roger Clemens. A hearing will be held later to determine if the Justice Department can bring this case to trial again or not. Clemens was charged with lying to Congress about his alleged use of steroids and other performance enhancing drugs. But wait, when did lying to Congress become a crime? The US Departments of Justice and Homeland Security have been lying to Congress about Operation Gunrunner for months. So much so that you might think lying to Congress was the new “national pastime”. Since the murder of US Border Patrol Agent Brian Terry, members of Homeland Security’s Bureau of Alcohol, Tobacco, Firearms and Explosives (BATFE or ATF) have been lying and covering up their involvement in supplying the guns used to kill Agent Terry. 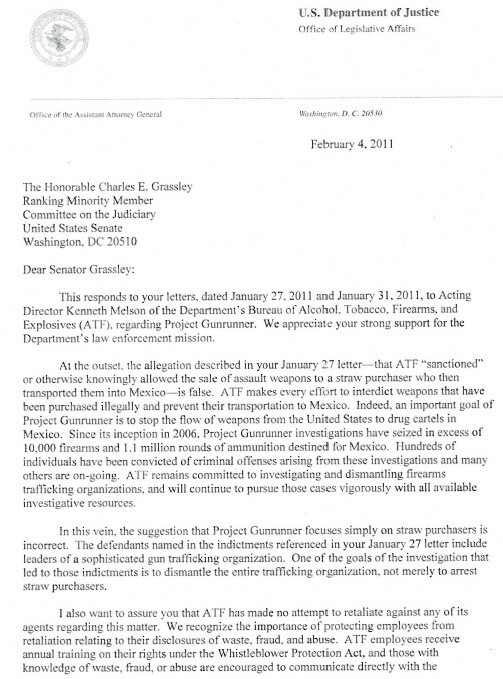 In February, I reported that Assistant U.S. Attorney General Ronald Weichdenied the ATF’s involvement in supplying assault weapons in a letter to Senator Charles Grassley in reponse to his inquiries about this subject. 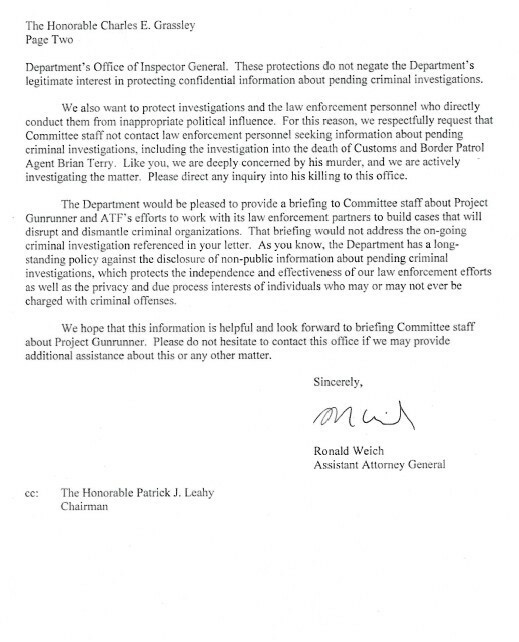 (Letter from Weich at DOJ to Sen. Grassley – PAGE 1, PAGE 2.) Why is he not being charged with lying to Congress? In my May interview with Congressman Ted Poe (R-TX), he said, “The whole idea is nonsense“, Congressman Poe said about Operation Gun Runner. “A thousand or more of those weapons have gone to Mexico.” Poe indicated this is an issue that Congressman Lamar Smith, Chairman of the House Judiciary Committee should be interested in looking into. What is the height of hypocrisy is that our government thinks that a baseball player allegedly lying about whether or not he used steroids rises to the level of a prosecutable offense when members of our government are allowd to repeatedly lie to Congress with impunity. Somehow our national priorities are just a little messed up. I say it is time that Congress take action against high level government officials lying to them. What do you say? In an exclusive interview with TexasGOPVote, US Representative Ted Poe (R-TX 2nd CD) talks with Bob Price of US Border Watch and TexasGOPVote about a variety of topics including the Bureau of Alcohol, Tobacco, Firearms and Explosives’ (BATFE, ATF) bungling of Operation Gunrunner leading to the deaths of US Border Patrol Agent Brian Terryand Immigrations and Customs Enforcement (ICE) Agent Jamie Zapata. Congressman Poe also discussed his own plan for securing the US/Mexico Border and the overreach of the Federal Government’s EPA into areas like light bulbs, Texas air quality and offshore drilling. “The whole idea is nonsense”, Congressman Poe said about Operation Gun Runner. “A thousand or more of those weapons have gone to Mexico.” Of course the ATF has not been able to trace those guns. We also discussed the hesitation of Border Patrol Agents to act in their own defense because of prior wreckless prosecutions of Border Patrol Agents by former US Attorney Johnny Sutton. This could be part of the reason why Border Patrol Agents are taking “bean bag weapons” to the gunfight along our southern border. Congressman Poe discusses this in the following video. On Border Security, Congressman Poe has proposed a resolution named the “National Guard Border Enforcement Act“. This bill calls for deployment of 10,000 National Guard troops along the US/Mexico border. The troops would be paid for by the federal government, but would remain under the control of the border state governors. This would enable the troops to retain law enforcement authority while guarding our border. On the EPA, Congressman Poe said, “The EPA should not be in control over what kind of lights we have in our home and offices.” This was discussed during our conversation about a South Carolina bill that would allow the manufacture of incandesent light bulbs in South Carolina to only be sold in South Carolina thereby nullifying the overreach of the EPA by eliminating their Interstate Commerce “jurisdiction”. Of course, we must also look at Mr. Poe’s now famous speech on the House floor about the infamous CFL light bulbs. More of Congressman Poe’s unique House Floor speeches can be found on YouTube.